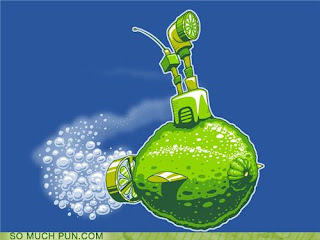 "Ruffle the rhythm and it must be Sublime"
I’ve mentioned the use of lime in Corona to cover up the “skunky” flavor of oxidized humulones (click here to see post). Lime tastes good with beer, even to a beer purist. 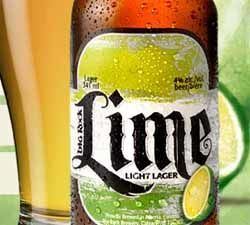 Eventually someone caught on and started marketing a lime-flavored beer. Some lime beers end up tasting more like a Shandy (half beer, half lemonade). However, anything is better than the sugar-laden, fluorescent pseudo-sodas in the cooler (Palm Bay anyone?...No? Didn’t think so). Keep your dignity. Bud Light lime made it big when it was introduced the summer of 2008. Every brewery started making their own version: Big Rock Lime, Dead Frog...even Corona. Miller Genuine Draft jumped on the wagon too, and produce a lemon version as well. Why did I choose to write about lime beers in the middle of Winter? Because I want to pretend it’s summer. And I found some cheap ones in the sale bin. Beer on a budget. Enjoy this smoky and sweet cornbread made with Big Rock Lime. Line a 9 x 5 x 2 1/2-inch metal loaf pan or 12-cup muffin tin with parchment or muffin liners. Mix first 7 ingredients in large bowl. Whisk milk, lime zest, lime juice, eggs, melted butter and chipotles in medium bowl. Add buttermilk mixture to dry ingredients; stir until blended. Bake until tester inserted into center comes out clean, about 35 minutes for the loaf or . Cool in pan on rack 15 minutes. Turn bread out onto rack; cool completely before slicing.